Esther Lederberg was a major pioneer of bacterial genetics. She discovered the lambda phage, a bacterial virus which is widely used as a tool to study gene regulation and genetic recombination. She also invented the replica plating technique, which is used to isolate and analyse bacterial mutants and track antibiotic resistance. Esther Miriam Lederberg was the oldest of two children born to David Zimmer and Pauline Geller Zimmer. Her father was born in 1896 and grew up in Sereth, Bukowina, a part of the Austro-Hungarian empire. He later settled in United States, where he ran a print shop in the Bronx. Growing up during the Great Depression, Esther remembered having just a piece of bread topped with juice squeezed from a tomato for lunch. She was very close to her grandfather. When he tried unsuccessfully to teach her male cousins Hebrew, she asked him to teach her. This was an unusual request because in the Orthodox Jewish tradition girls were not expected to study Hebrew. Esther learnt the language very quickly, making her grandfather very proud when she did all the Hebrew reading for the Passover seders. In December 1946 Esther married Joshua Lederberg, just five months after Joshua wrote her a letter to ask about her research on Neurospora, a type of mould. Joshua was doing a doctorate at Yale University and she working in the laboratory of George Beadle as part of her master's programme at Stanford University. They remained together until 1966 when they divorced. In 1993, when Esther was 70 years old, she married Matthew Simon, an engineer, whom she met in 1989 shortly after he joined Stanford University. She and Matthew shared a passion for music. Esther had a strong interest in medieval, Renaissance and Baroque music. Esther attended Evander Child's High School in the Bronx. After graduating from school at the age of 16, she won a scholarship to study at Hunter College, City University of New York. Her initial intention was to study French or literature. She soon switched, however, to biochemistry against the advice of her teachers who felt women struggled to get a career in sciences except in the field of botany. In 1942, at the age of 24, on completing her undergraduate degree, Esther was awarded a distinction, and two years later she won a fellowship to Stanford University to take a master's course in genetics. As the fellowship was not enough to survive on, she supplemented her income by working as a teaching assistant in a laboratory, and obtained free accommodation by washing her landlady's clothes. Sometimes she had so little money she recalled having to eat frogs' legs left over from laboratory dissections. In 1945 Esther spent the summer studying with Cornelius Van Niel at the Hopkins Marine Station at Stanford University. The following year she completed her master's degree. Soon after she moved to the University of Wisconsin to join her husband, Joshua, where she began a doctorate under the supervision of R A Brink. She was supported by a United States Public Health Service Fellowship. Her research focused on the process of genetic mutation in the bacterial species Escherichia coli. She completed her doctorate in 1950. Early on Esther decided to pursue research-oriented work over the more financially lucrative jobs open to women during the Second World War. This was in part driven by her belief that such jobs would be taken away from women once the war was over. She also recognised that research positions were more open to women and provided greater opportunities to advance her scientific knowledge. Between 1941 and 1942, while pursuing her undergraduate studies, Esther worked as a research assistant for Bernard Ogilvie Doge, a plant pathologist at New York Botanical Garden. He introduced her to the mould Neurospora which she continued to research for a number of years. Following graduation she worked with Alexander Hollaender and Milislav Demerec in the US Public Health Service based in the Carnegie Institute of Washington's Department of Genetics (now Cold Spring Harbor Laboratory). The group were investigating the genetics of bacteria as part of the effort to increase the yield of penicillin, an antibiotic produced by the mould Penicillium notatum. Based on this work she jointly authored a paper with Hollaender outlining the effect of ultraviolet radiation and x-rays on mutation production in Penicillium notatum. Published in 1945, this was Esther's first paper in genetics. In 1944, Esther was hired as a research assistant to the geneticists George W Beadle and Edward Tatum at Stanford University. Her work with them greatly assisted their winning of the Nobel Prize in 1958 for discovering the role of genes in regulating biochemical events in cells. Three years later she joined her husband at the University of Wisconsin as his unpaid research associate. Together they launched experiments to investigate the way bacteria manage to adapt and become resistant to a drug to which they were previously allergic. In aiming to understand how chromosomes behave, they demonstrated for the first time that mutant changes occur so rapidly in bacteria that the process could be be tracked in the laboratory. Although Esther was recognised as outstanding in the laboratory both experimentally and methodologically, she struggled to get a permanent academic position. In part this reflected the wider discrimination against female scientists at the time. She had the further challenge of being married to and collaborating with Joshua who, by virtue of being a man tended to attract greater public attention. Esther's modest nature also did not help. In 1953, when Joshua accepted an award from Eli Lilly and pointed out that she too should have been given it because she had played a pivotal part in his work, she characteristically downplayed her significance, arguing 'there are six or eight people in the background every time someone gets an award’. 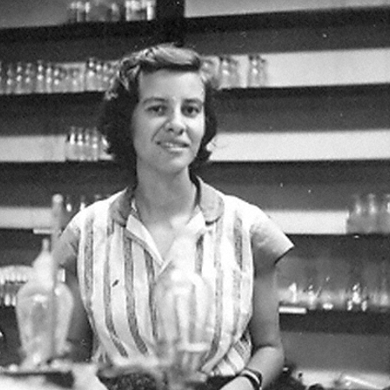 When Joshua moved to Stanford University as head of genetics, in 1959, Esther was appointed as an untenured research associate professor in department of microbiology and immunology. This happened after she and two other women petitioned the dean of Stanford University's Medical School over the lack of women professors on its faculty. Her appointment was made on the basis that she was willing to accept an untenured post. She was in fact overqualified for the position. Like many other women scientists at Stanford University, Esther continued to struggle for recognition for many years. In 1974, fifteen years later, Stanford University changed her title from Senior Scientist to Adjunct Professor. This still did not give her tenure and was effectively a drop in rank. Her contract was to be renewed on a rolling basis and was dependent on her securing research grants. Esther was subsequently invited by the biochemist Stanley Cohen to become the curator of Stanford University's collection of plasmids, small autonomous self-replicating DNA molecules. Plasmid had first been discovered in the 1940s and Stanford had built up a collection from around the world. In 1976 she was appointed director of Stanford's plasmid Reference Centre. As curator she became a key arbiter in the naming of plasmids and the genes that they carried. She continued as the Centre's curator until 1986. Esther's first major achievement was her discovery of the lambda phage when completing her doctorate in 1950. She spotted it when she observed irregular patterns in a culture with different colonies of the bacteria Escherichia coli K-12 (E-coli), including a strain that had been irradiated with ultraviolet light called W-518. What she noticed was that some of the colonies appeared to be missing some segments. Further investigation revealed that this was due to a latent virus in the E-coli K-12 which had become active in the mutant W-519 strain and was preventing its growth. Subsequently Esther was able to show that the lambda phage behaves differently from other known viruses. Unlike other viruses that multiply rapidly inside a host cell and kill it, the lambda phage integrates its DNA into that of the infected bacteria. This allows the virus to pass on its genetic instructions to produce progeny viruses to new generations of bacteria without destroying the host organism. She established further that the process was helped by a mediator she called 'Fertility Factor F', and that the viral genetic material remained dormant unless the bacterium came under stress. This happened for example when it was deprived of nutrients, at which point it reproduced and destroyed the infected cell. Today the lambda phage is a key tool in molecular biology. In part this is because it can be grown easily in E-coli and it is not pathogenic except in the case of bacteria. It has proven particularly helpful in understanding the transfer of genetic material between bacteria, the mechanisms involved in gene regulation and how pieces of DNA break apart and recombine to make new genes. It also serves as a model to study other viruses with similar behaviour, such as the herpes virus, and is also used as a marker of molecular weights. The phage is also an important tool for genetic engineering. Researchers are also exploring its use in the clinic, deploying the phage to treat bacterial infections. Known as phage therapy, which was first developed in the 1920s, this type of treatment is gaining increasing attention as a possible alternative to antibiotics. In addition to discovering the lambda phage Esther invented the replica plating technique. Devised by her in 1951, this method enables scientists to replicate bacteria colonies on a series of agar plates with exactly the same spatial configuration. Having access to replica bacteria colonies was important for comparing bacterial reactions to environmental changes such as nutrition or temperature. Prior to Esther's invention scientists had tried several methods with little success, including the use of blotting paper, metal brushes with small prongs and even toothpicks. Esther developed what was like a rubber stamp with an ink pad. She attached a square piece of velvet to a piston ring. This was, and still is, first pressed on a Petri dish to get an imprint of the colonies to be copied and then pressed onto another dish. What is vital to the process is the thickness of the pile of the velvet. The surface fibres of the fabric are used like hundreds of tiny inoculating needles to transfer bacteria from hundreds of colonies, each derived from a single bacterium, to a series of agar plates prepared with different ingredients. Each plate has different ingredients added, such as antibiotics or nutrient supplements like amino acids and vitamins. Once the transfer process is complete the replicas are incubated and compared with the original plate. The process helps reveal mutant bacteria incapable of forming colonies in the absence of a specific nutrient. It will also show up bacteria resistant to a specific antibiotic as these will flourish in on the plates with the antibiotic. Esther's replica plating technique provided the first way of proving experimentally that bacteria develop resistance to antibiotics spontaneously. Previously scientists assumed such resistance was always caused by exposure to an antibiotic. In 1956 the Society of Illinois Bacteriologists awarded the Pasteur Award to both Joshua and Esther Lederberg, given in 'recognition of their contribution to microbiology, particularly for their fundamental studies in bacterial genetics. This was the first time the award had ever been given to a team of researchers. Two years later, Joshua received the Nobel Prize for Physiology or Medicine for discovering that bacteria can mate and exchange genes. Much of this could not have been achieved without Esther who was more adept at experimental work than he was. Her isolation of the Lambda phage and her discovery of its genetic replication process, as well as her innovative replica plating technique, were clearly crucial to Joshua's research.